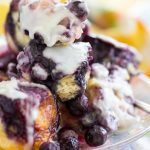 This quick & easy, short-cut Lemon Blueberry Pull-Apart Bread can be prepped in 10 minutes for a simple and elegant brunch recipe. 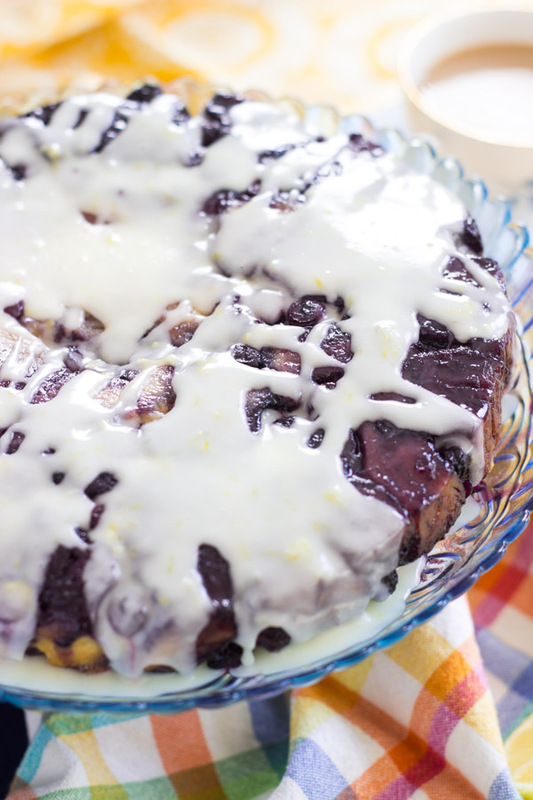 Each piece of dough is rolled in butter and lemon-sugar, then buried with fresh blueberries, and drenched in lemon glaze! 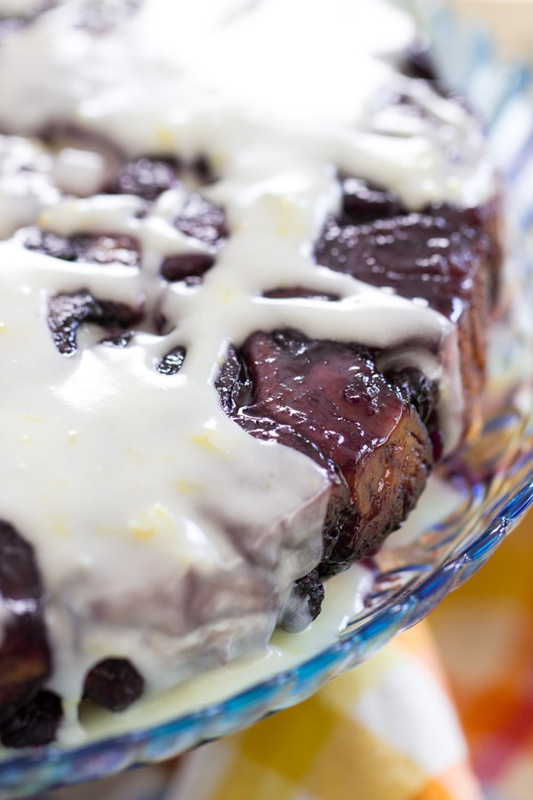 I couldn’t decide what recipe to write about today for you guys, but I just got a comment a few minutes ago on this Lemon Blueberry Bundt cake with Lemon Glaze, and that reader was searching for lemon blueberry desserts. 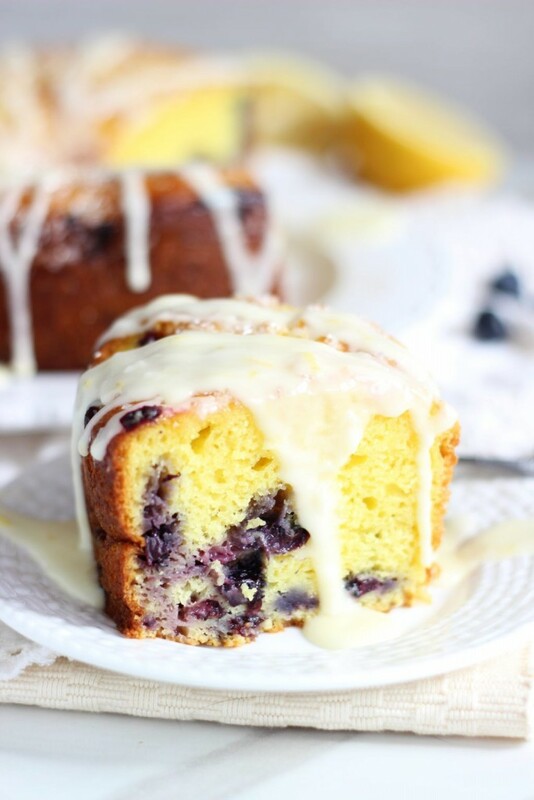 I decided that I needed to get you this Lemon Blueberry Pull-Apart Bread. 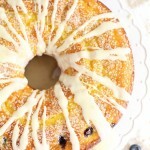 Everybody is all about that bundt cake right now, so here’s another lemon & blueberry treat for you. 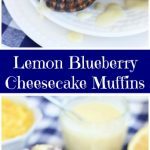 I actually have so many lemon and/or blueberry recipes right now that I’m tempted to do a themed week dedicated to those two fruits. It wasn’t on purpose – those are just a few key ingredients that speak to me this time of year. I go with what I’m inspired by, know what I mean? 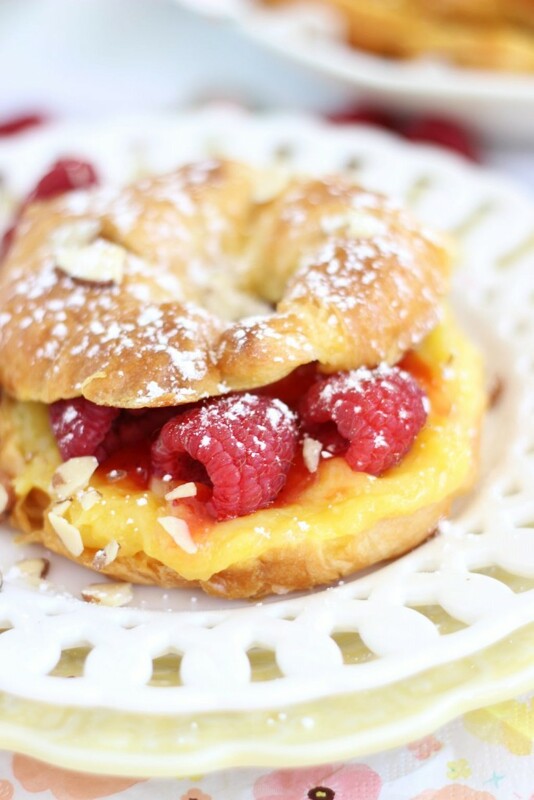 We’re all ready for spring, and I instantly start to want citrus and berries. 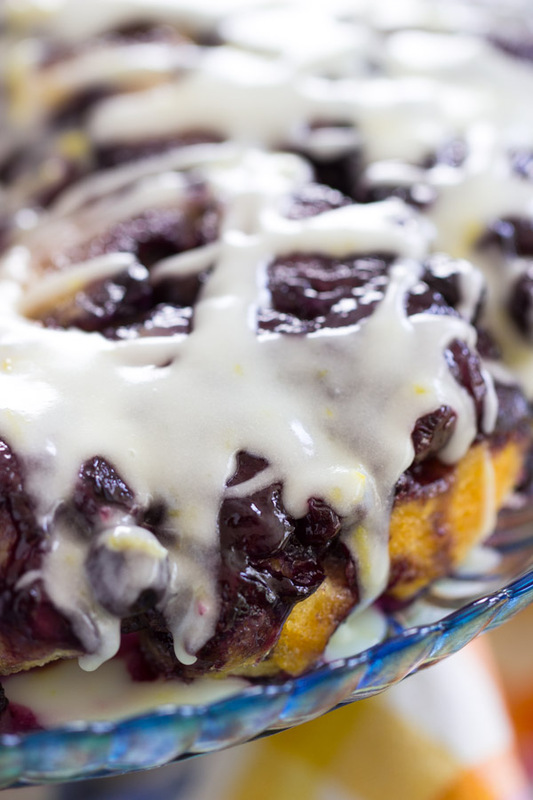 I had the idea for this Lemon Blueberry Pull-Apart Bread, and I wanted it to be a breakfast/coffee cake-type recipe. I have monkey bread recipes on the site, and they are not dissimilar to this, but this is made in a cake pan, and is a little smaller. The monkey bread recipes, made in a bundt pan, like this Honey Cinnamon Monkey Bread and this Snickers Monkey Bread, are quite big, and are quite dessert-focused! 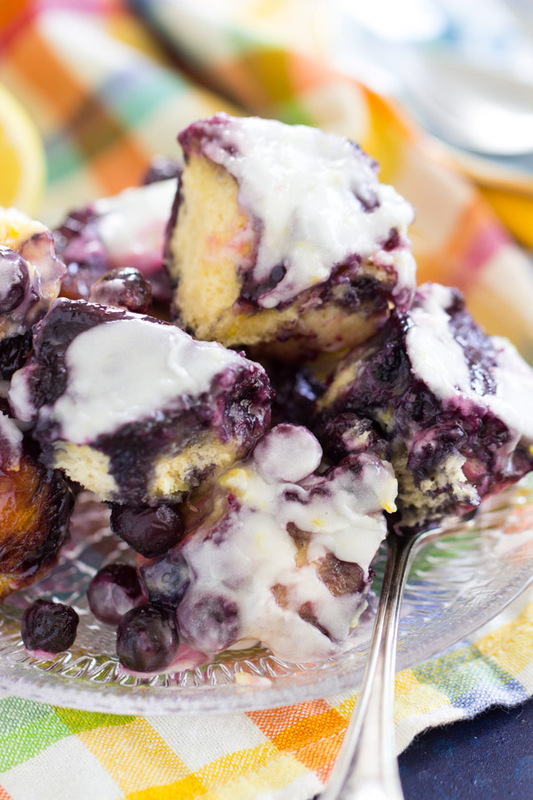 This Lemon Blueberry Pull-Apart Bread is more like a breakfast food. I almost didn’t add blueberries because I just knew they were going to burst and turn the whole thing blue. And well, they did. And since this is kind of an ‘upside down’ pull-apart bread, I flipped the bread out and the entire ‘top’ was blue from the blueberry juice seeping to the bottom. I’m totally fine with this. You? I definitely expected that to happen, but I guess it could be a slightly prettier food! But it’s so damn good that you’ll barely care what it looks like. 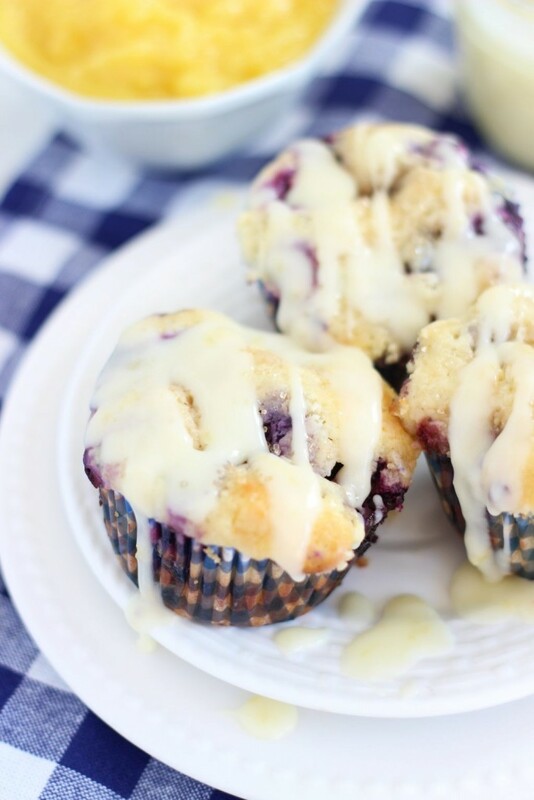 Besides, that’s what glaze is for. 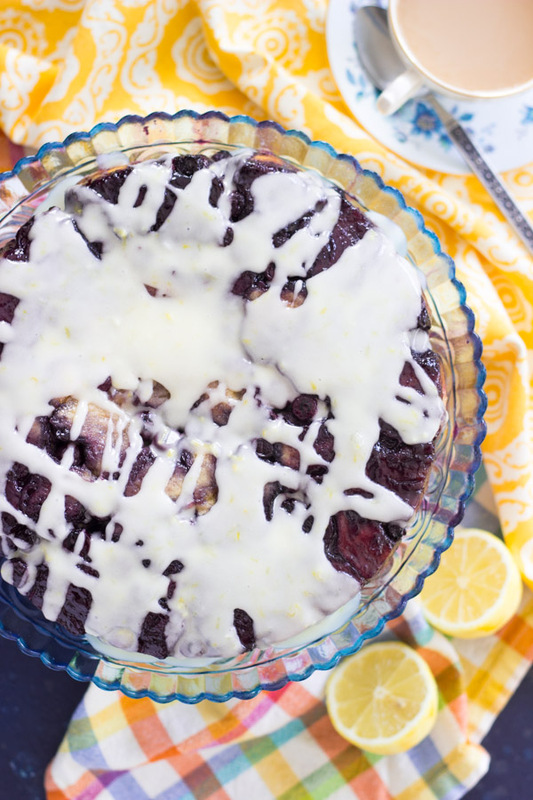 Sweet, tangy, drippy lemon glaze. 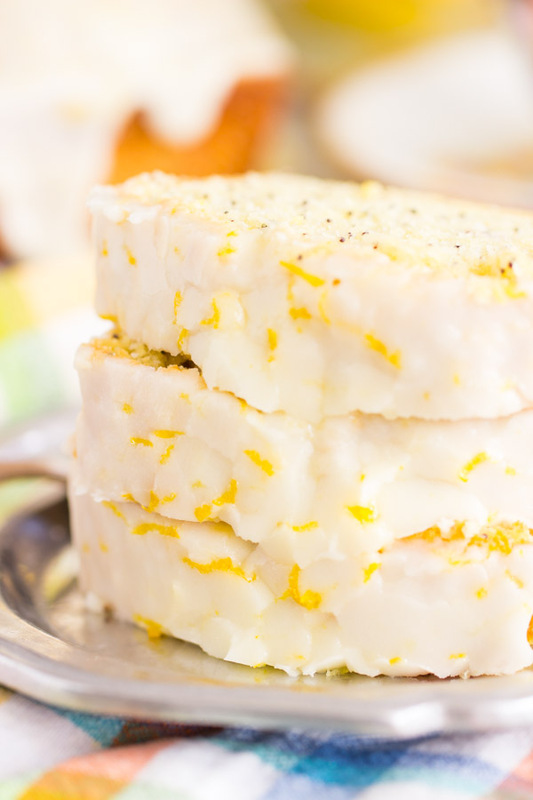 Made with fresh lemon juice and lemon zest, it adds so much bright citrus zip. For the bread, I cheated and used refrigerated biscuits, of course. I don’t care that it’s a short-cut, and that it’s ‘cheating’. 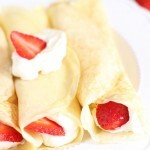 The big Pillsbury Grands that are flaky and buttery – I love those things, and that’s that. I cut them into quarters, rolled them into balls, and rolled them in butter, then a combo of sugar + fresh lemon zest. 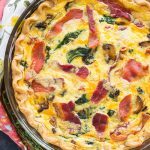 They are so ideal for days when you don’t want to deal with yeast, and you want to get something together that’s quick and easy, but doesn’t sacrifice deliciousness. 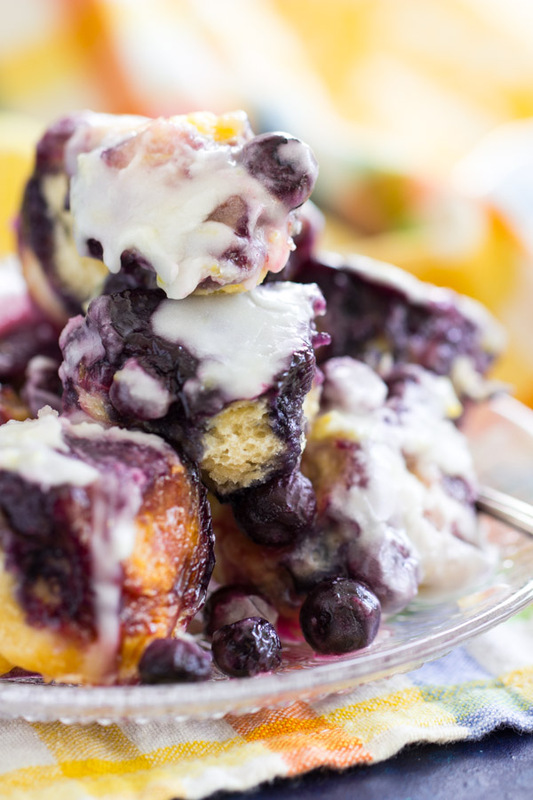 Each little nugget of dough is coated in lemon-sugar, and then nestled in the pan with fresh blueberries. 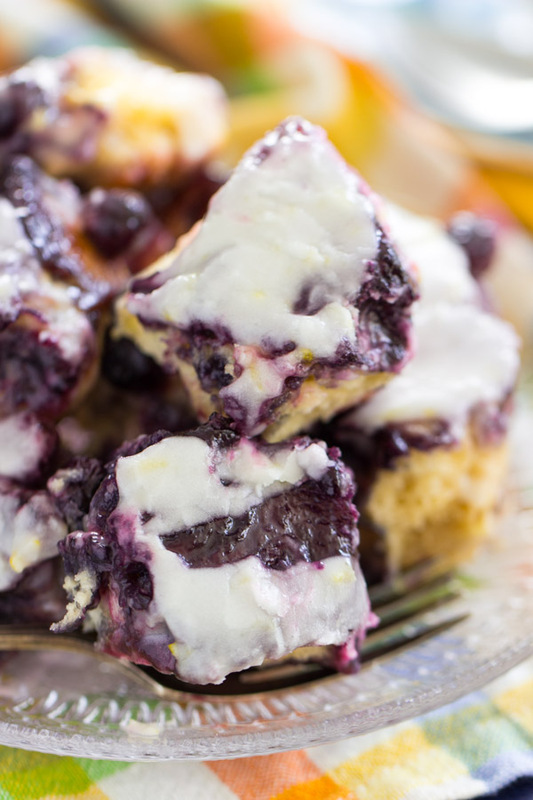 You can get this Lemon Blueberry Pull-Apart Bread prepped in about 10 minutes, and ready in about 35 minutes from start-to-finish. In a large bowl, stir together sugar, butter, and lemon zest. Toss the biscuit pieces with the sugar mixture. Scatter half the blueberries in the bottom of the cake pan. Arrange the biscuit pieces in the cake pan. Bake at 400 degrees for 20-25 minutes, or until the edges are golden brown, and the center doesn't feel doughy when lightly pressed. Remove from the oven, and immediately invert onto a serving plate. In a small bowl, whisk together lemon zest, lemon juice, and 1 c. powdered sugar. 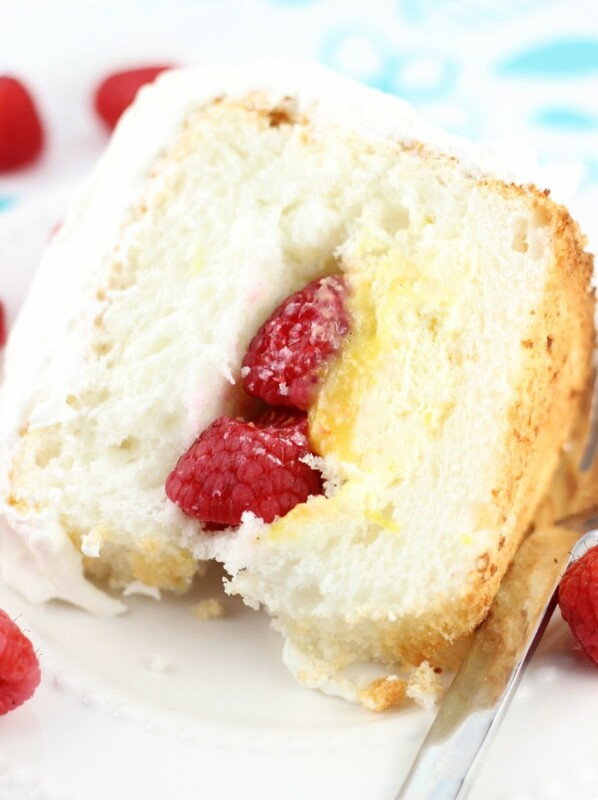 Depending on how juicy the lemon was, you may need more or less powdered sugar. Add enough that you have a thick glaze, but that it still drizzles. Drizzle over the warm bread. Serve immediately. You may also like these springtime favorites! 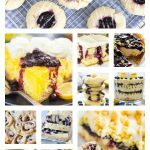 23 Heavenly Lemon Blueberry Recipes!